How to use email signature feedback with smiley to deliver another opportunity for customer review? This was the issue for AWP (Area Wide Protective) who provide traffic control to 19 states and part of Canada. They also offer a variety of traffic control products and services for construction projects and events, specifically providing flagging, safety consulting, and equipment. AWP has over 4,000 employees working on projects, supported by a large team dedicated to customer service. They were measuring customer service performance by the level of complaints received, but now looking for a more proactive tool with which to gauge customer satisfaction. With this in mind, AWP brought us in to provide a method for customers to deliver feedback. Specifically, they wanted emoticons – Smiley Faces that can be used within an email. We proposed a solution using an email auto-signature that incorporated a request for a quick rating. See the example below. Each of the smiley faces is active so that when selected, it registers the satisfaction rating for that staff member. Moreover, if either of the ‘sad’ faces is clicked a web screen requests a little more information and a quick alert message is sent to the AWP team. This allows a timely reaction to fix the issue, salvage that customer and counsel the staff involved. The customer is always thanked for their feedback, and the entire smiley face survey process lasts no more than 5 seconds. AWP now has visibility to the data for each support staff via an online dashboard – in fact, a TV monitor in the Customer Support office displays real-time results and the trend over time. This means the team is always aware of their group’s performance. Since the beginning of 2018, over 2,300 responses have been received to their email signature feedback program. 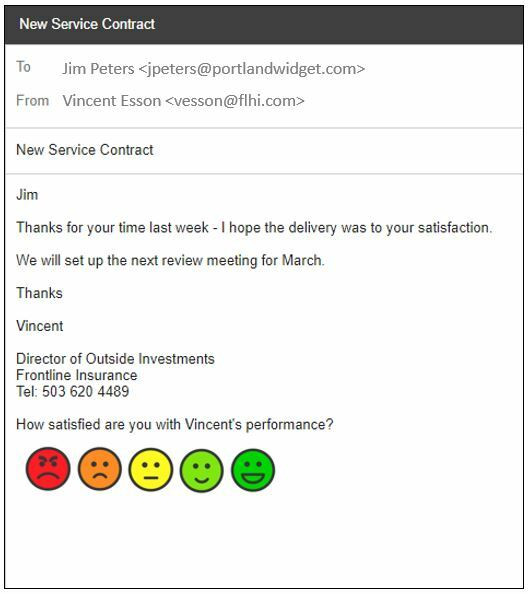 We have a downloadable product sheet on the use of Smiley Faces or icon feedback in both email signatures and tablets. Go to the Product Sheet page and scroll down to find the document you want to download. It’s free.